Powers/Abilities: In its original form, Pisces was adapted for life underwater, possessing fins, scales and gills. In its second form, Pisces possessed enhanced strength and durability. In its third form, Pisces possessed fins, gills and scales to assist it in underwater combat, and the ability to produce a watery mist from her body. She exhibited a personality based on the Pisces sign of the Zodiac, claiming to have prophetic dreams. 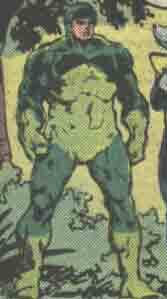 History: (Defenders I#48 - BTS) - Pisces was created in the "Theater of Genetics" by Scorpio, who wanted him to serve as a member of his Zodiac, and to be his friend. (Defenders I#50) - Unfortunately, Pisces was not yet ready to be awakened, and collapsed upon the floor with Capricorn soon after coming to life. When Scorpio found him, dying, Pisces begged its creator to explain what had happened. (West Coast Avengers II#26 (fb) - BTS) - Now existing in an LMD body himself, Scorpio created a new Pisces using the Zodiac Key. (West Coast Avengers Annual#1) - Pisces joined the other Zodiac LMDs under the leadership of Quicksilver in his attempt to gain revenge upon the Avengers. Pisces joined Aquarius, Capricorn and Sagittarius at the "Anthill," an abandoned Sentinel base. Pisces faced Thor in battle, and was destroyed when Thor crushed it beneath a giant piece of machinery. 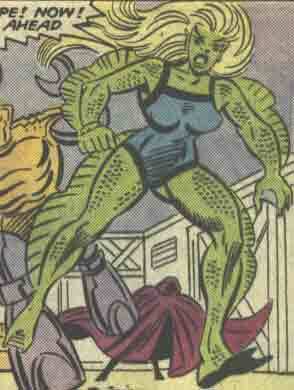 (West Coast Avengers II#26 (fb) - BTS) - Scorpio created another Pisces, this time granting it a female appearance. (West Coast Avengers II#26) - Pisces joined the Zodiac LMDs in an assault upon the human Zodiac Cartel in Dallas, Texas, killing all of them except for Cornelius Van Lunt, and assuming control of the cartel. Later, Pisces joined the LMDs in an attempt to rob businessmen at a cattle auction in Wichita, but they were interrupted by the West Coast Avengers. 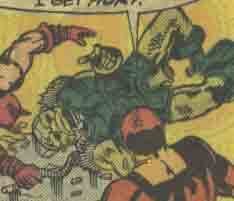 Pisces confronted Henry Pym, but was horrified when Sagittarius was slain by Hawkeye. Claiming that she had had a prophetic dream in which Sagittarius had died, Pisces panicked, and the other LMDs soon followed, forcing Scorpio to call a retreat. He berated Pisces afterwards, but she observed that it was part of her programming. (West Coast Avengers II#27) - Pisces joined the LMDs in an attack upon Hawkeye, but when she attempted to unleash her mist attack, Hawkeye cut the cord to Aquarius' gun, causing his electrical energy to short out her, Aquarius and Gemini. After Scorpio had replaced Hawkeye with his new Sagittarius LMD, he met with the other LMDs to explain their plan to trap the Avengers, which Pisces agreed with. (West Coast Avengers II#28) - Pisces joined the LMDs in robbing the Denver Mint, but were interrupted by the Avengers, though Scorpio managed to teleport them to Death Valley along with their loot. When the Avengers caught up to them once more, Pisces clashed with the new Leo LMD, which had been made to look like Tigra, and possibly allowed herself to be defeated. When Scorpio brought the Avengers and LMDs to the Ankh Dimension, hoping to have an advantage, the LMDs were all shut down instead, leaving them immobile in the Ankh Dimension. I'm assuming that the Pisces and Cancer LMDs were destroyed in West Coast Avengers Annual#1 because the human Cancer identifies two as having been destroyed in that encounter when he does a recap in West Coast Avengers II#26, and those are the only two who suffered serious damage.